Approximately 40 minute guided walking tour of New Orleans City of the Dead, St. Louis Cemetery No. 1. Located just across the street from the French Quarter, you'll be able to easily walk from your hotel or bed and breakfast for your Cemetery tour. Your tour is lead be a licensed guide. You'll visit the tomb made famous in the 1969 movie Easy Rider. This active cemetery boasts some of New Orleans most famous residents, like Marie Laveau the Voodoo priestess, and Homer Plessey, who's landmark case before the US Supreme Court changed the course segregation in America. You'll also see actor Nicholas Cage's future resting place. Your 40-minute walking tour within the gates of St. Louis Cemetery No. 1 is led by an experienced, licensed guide who will accompany you throughout your exploration of the city's oldest active burial site. 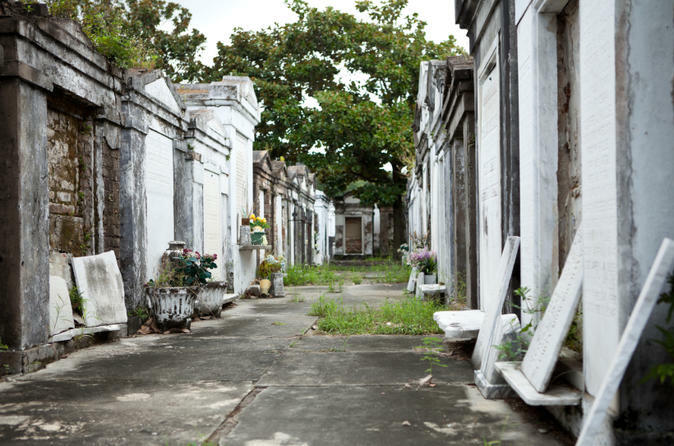 You'll see the tombs of famous New Orleaneans like Voodoo Priestess Marie Laveau, the future resting place of actor Nicholas Cage, world renown chess champion Paul Morphy and some of the greatest jazz pioneers to grace our city. Your guide will bring you through the maze of tightly assembled tombs, which hold the remains of some of the city’s important historical figures. You'll also learn why New Orleans had to bury its dead above ground. Your tour cost includes the fees charged by the Archdiocese of New Orleans.